Easy, hands-free communication throughout your home keeps you in touch. On-Q/Legrand®, the connected home market leader, announced a new name for its award-winning line of Cat 5 Intercoms — inQuire™ Intercoms. Offering a sleek, modern look that fits in a standard decorator wall plate, On-Q inQuire™ Intercom Systems are an affordable option for every home because they are Cat 5-based. This also allows On-Q inQuire™ Intercoms to integrate seamlessly with other On-Q subsystems, such as the lyriQ™ Audio System. This next generation intercom that will keep your family connected using stylish, wall-mounted package about the size of a decorator light switch. You get great features like hands-free reply from every unit, multi-level volume controls with sleek, back lit keypads, plus high-quality speakers and microphones for crisp, static-free sound. So whether you're listening to the baby sleeping while answering your email, or screening visitors at the front door, the inQuire™ Intercom System will simplify your life- and keep in touch. By combining an innovative lifestyle-solutions approach to selling home technology with elegant, award-winning products, On-Q/Legrand® is the only source you need to succeed in the connected home market. Cat 5 Based Reduced the cost of installation through the use of Cat 5. No need to carry special intercom wire! Standard Cat 5 wire - from your choice of manufactures - is all that you'll need. For quick and simple installation, all of the intercom stations feature convenient punch down blocks. Separate Speaker & Microphone Deliver Superior Sound Why sacrifice sound by using a single speaker/microphone combo? On-Q/Legrand® improves upon current intercom designs on the market today by offering a separate microphone and a high-quality speaker to deliver crisp, clear sound that is integrated seamlessly in each intercom unit. Home Runs from the Structured Wiring Panel Why would you want to run separate intercom wires to a station in the kitchen? Improve your efficiency by running standard Cat 5 from each room to the structured wiring panel. Interfaces With Subsystems By running the intercom back to the structured wiring panel, the intercom system can interact with other existing subsystems – such as the whole house audio & camera monitoring systems – to offer extra features. Sleek Updated Look Want an intercom that doesn't look like it was made in the 70s? 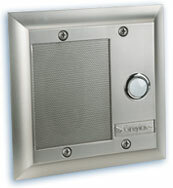 The inQuire™ Intercom offers a modern design that trims with a standard decorator wall plate - perfect for any decor. The inQuire™ Main Intercom Station adds an extra section with status indicator lights. These lights have a short text label for each of the 12 possible station locations. The indicator light shows if that room is talking, on mute, or is in monitor mode. This is your main control station, typically installed in the wall in a central location like the kitchen or sometimes in a more private area like the master bedroom. From this unit you can monitor the status of your entire intercom system. The Main Intercom Station by itself fits into a 3-gang box and can be ganged with other decorator-style devices. 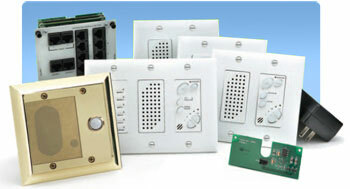 Weather-resistant door unit provides easy communication between the door & all indoor/room units. Available in both classic and modern finishes that are guaranteed to increase the curb appeal of any home. Install the optional door chime on the intercom module, and a chime rings through the other intercom units in your system when a visitor presses the button at your door. Back lit button allows for easy operation at night. 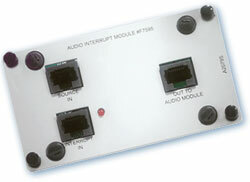 The audio interrupt module is designed to compliment the inQuire™ Intercom System. It works in conjunction with both the lyriQ™ Audio System and the inQuire™ Intercom System by automatically muting any music that is playing through the lyriQ™ Audio System. It allows you to hear any pages over the inQuire™ Intercom System Once the inQuire™ Intercom System remains inactive for 10 seconds, the audio level on the lyriQ™ Audio System is then restored to its previous level. 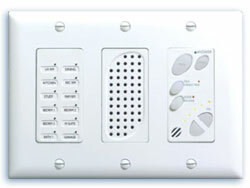 The Audio Interrupt Module is a great addition to the inQuire™ Intercom and lyriQ™ Audio Systems. Automatic operation which restores audio to its previous volume after 10 seconds.